Baking and cooking in season is all the rage. This always makes me shake my head because as far North as I live we’ve always eaten seasonally. Maybe it’s different in a city where they have access to more variety. However, eating locally in the winter is a whole different ball game here where nothing grows for nine months of the year. I’ll always welcome oranges from New Zealand, but that’s another story. When we started plotting out my sister-in-law Dorian’s baby shower months ago I knew I wanted to use strawberries. I picked fresh ripe ones from Knapp’s Farm in Green Bluff, Washington late last June and froze them for cupcakes. 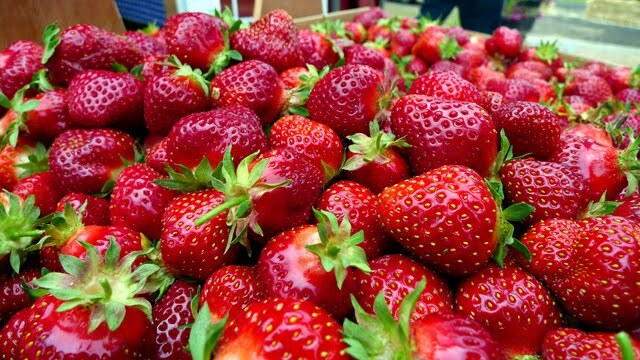 For me strawberries are a sign of birth and renewal. Hope for the months and harvests to come. As a symbol of anticipation and excitement for new life, these cupcakes work well at baby showers. Even fall ones. You don’t have to pick your own berries certainly, but use the best you can get. Frozen organic is always a more flavorful choice. Also, you can use blueberries, raspberries, blackberries, huckleberries, marionberries, or any berry of your choice. Dorian had a great baby shower with many friends, family, and well wishers there to support her. I’m happy I got to be part of it and am super excited to greet my new niece Rowan in January! Use the best quality berries you can get. They are the stars in these moist cupcakes. By letting the berry puree macerate for a day, the sugars will release making these cupcakes much better. 1. Gather enough thawed or fresh berries to make the puree plus more for the frosting (below). Then completely process the berries in a food processor and store in a covered bowl in the refrigerator for a day to let the sugars release. If using berries with seeds like raspberries or blackberries, strain the puree through a fine mesh sieve before refrigerating. 2. Preheat the oven to 350 degrees. Line a muffin tin with 12 muffin liners, or lightly butter and flour the tin. 3. In a stand mixer, or with a hand mixer and a large bowl, beat the butter, sugar, and salt together until mixed well. Then add the eggs, vanilla extract, and almond extract and beat until mixed well. Add the half & half or milk and berry puree and beat until mixed. Add the cornstarch and baking powder and mix to incorporate. Then add the flour and beat on medium speed for 30 seconds. 4. With an ice-cream scoop, divide the batter among the muffin tins. Bake for 20 to 22 minutes or until no longer wet looking and comes free of crumbs when tested with a toothpick. 1. With a stand mixer or a hand mixer, beat all the ingredients together adding the powdered sugar a few cups at a time until desired consistency is reached. Berry flavor will come out even more after sitting for a bit. Flavor with strawberry extract only if needed. Use immediately and store extra covered in the refrigerator. 2. I piped the frosting on with a Wilton tip 1A by pressing lightly over the top into a fluffy ball. (I used less dense frosting this time). Then I gently tilted the cupcakes so the frosting would move to the edges. I topped them with Wilton Royal Icing Roses I found at Michael’s and sprinkled them with white nonpareils. 3. If you have a few days to dry them, you can make your own royal icing roses. 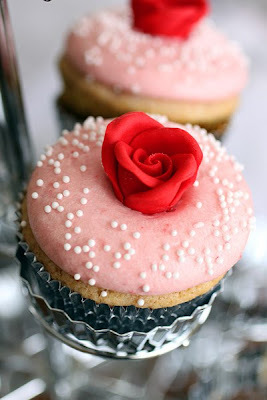 Wilton recipe for royal icing and rose instructions. "Doubtless God could have made a better berry, but doubtless God never did." (Dr. William Butler, 17th Century English Writer) Dr. Butler is referring to the strawberry. Strawberries are the best of the berries. “The delicate heart-shaped berry has always connoted purity, passion and healing. It has been used in stories, literature and paintings through the ages.” From the University of Illinois Extension page, please visit them for more fun and interesting strawberry symbolism. These are lovely, Laura! I always think of strawberries in summer, not fall, but these make me crave berry picking now! Hope you had a wonderful time at the shower!! Lovely cupcake...Love strawberries but I want all the berries in mine..LOL Love mixed berry cupcakes. Carla and Jackie!!! Thank-you so much for coming to my site. Yay!!! These are really beautiful, Laura. I'm sure berries at this time of year were appreciated by all at the shower. These are so pretty! I love the idea of a strawberry cupcake, but the last time I made the ones from sprinkles, they turned out kind of gross and gummy. I might try these, but will have to wait in the summer. Macerating is the key - it's a trick I use in my moist strawberry muffins! If I could get my hands on some decent strawberries right now, I'd be whipping up a batch of these in no time! Maybe I'll make them with frozen berries - I can get excellent frozen strawberries any time. I am not a baker, but I want to be so badly. Except for the fruit, this recipe has almost all things I have at home. It looks easy enough and I have enough blind optimism to think I could make these. I may have to try. i used to have a strawberry patch when i was younger - i used to take so much good care of it, i duno what happened hehe. Hmmmmmm. . . . Love the cupcakes, love the recipe, and love the photos! What is there to say except for save me one please?? Laura, I was really interested to see this, because I have tried making cake with pureed fruit before and haven't exactly delighted myself. I can never taste whatever flavour it is I was after, or the cake doesn't bake up well. I'm thinking that the corn starch you have incorporated in these might have saved the day for me if I had thought to add it! How was the strawberry flavour? Just the cakes, not the frosting (which is lovely btw). I think I'll earmark this for later. I definitely haven't given up on my quest for fruity cake! You have decorated them really well (forgot to say that). Frosting is frustrating at the best of times, but your edging is superb. Cake obsessives like me notice these little things! 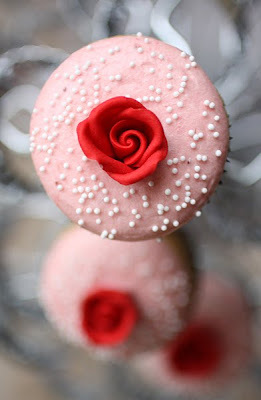 Wonderful looking cupcakes...beautifully decorated and photographed! And, oh so special for the special occasion! Thanks for the recipe...I'll look forward to trying them. Well, Laura; start packing. Photos were taken the first week of October! No snow in Tampa girlie! Guess I will get my guest room ready for you! But, you'll have to do all the cooking. lol. Mr P. the berry flavor comes through well on these cakes. I think probably the deep flavor of the strawberries to start and then letting them stew in their juices for a day, and finally cutting some of the flour with cornstarch. Thanks for the compliment on my frosting! Fantastic!! I think I'll fill these cupcakes with a great recipe I have for cream cheese whipped cream. Oh, I love cupcakes and berries of all kinds. I'll definitely try this! You've completely captured my heart with these, Laura, and they're bookmarked for later. Thanks for the nice replies on Flickr. I really would like to learn how to make these wonderful decorations when my trial is over for work and I have free time again. I honestly have to say that these are one of the best cupcakes I have EVER had. I am so honored you chose to make them for my shower. I am printing this blog post and pictures to save for Rowan when she gets older so she can see what her Aunt Laura made for her! These are so perfect and beautiful! I love them! WOW these are lovely! I love the fact that you have always eaten in season, not just when it is trendy! We are blessed here in So. Cali. to have alot of fresh fruits and veggies year round, so I will grab some fresh strawberries and make these beautiful cupcakes! Thanks for getting back to me. I'll give it a go, 'cause I have an idea for a flavour I want to try out! These are beautiful and your decorating talent is wonderful! Congrats on the soon to be addition to the family (maybe on my birthday?). These cupcakes look beautiful! I never think of strawberries in the fall--great post. Your blog is fantastic, btw!